6.46am and Campari, mother to 3 x 5 month old cubs (one behind the mound) is up early and ready to start the day on the open plains of Namiri- Serengeti, TZ. Gorgeous! I love the eye contact with two of them. Very pleasing image. Nice colors and comp. Beautiful animals. She's a beauty, Marc! I just hope some of the three survived. 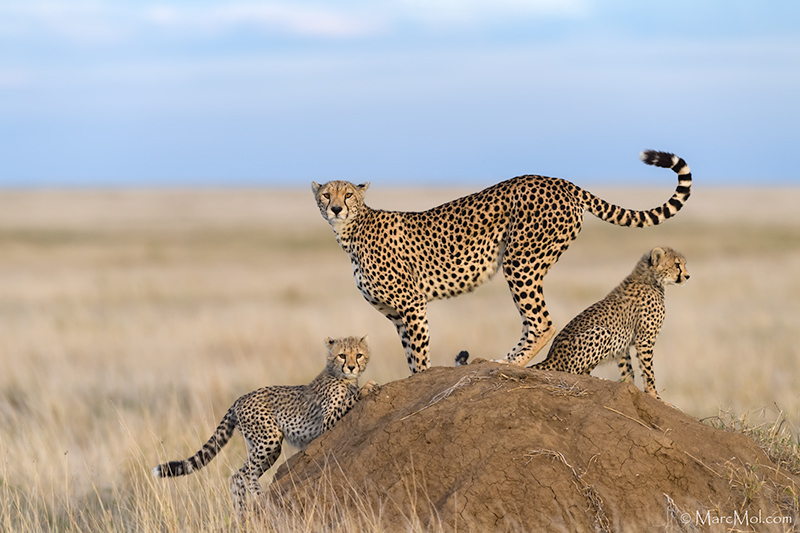 Do you know if the survival rate for cheetah cubs on the Serengeti Plains is any better than it used to be ? I know that a few years ago the mortality rate was about 90%, and more recently about 70%, mostly due to Lion predation. I was wondering if you knew how things were now. Love the positioning here and the eye contact! Wonderful composition. I like the eye contact and body postures of the three. I'm sure they didn't sustain this position for long, so nice timing! I do keep in close touch with Dennis Minja from Serengeti Cheetah Project, and the cub mortality statistics for Serengeti have always hovered around 90%, (at least in my 38yrs travelling here... I guess your 70% figure may have been a brief satistic anomaly?) and this is still the current figure having just traveled with him whilst he gives lectures around the various camps in Serengeti ( I contriibute images for their research) with the majority of cubs falling to Hyena & Lion, (inexperienced mothers). There are a lot of very good mum's doing well who regulary see 2/3 cubs to maturity, back in 2010 "Shingo" from the Mara saw all of her 6 cubs to maturity, what a brilliant mum she was! During this trip, I closely followed 2 females (Campari & Keziah) both with 3 cubs, 5 & 6 mth old respectively (as of Dec) and all 6 are still alive and doing well. Sadly though, total overall numbers are now down to between 6500-7000. Having said that, of all the areas throughout Africa, the greater Mara/Serengeti ecosystem is still a stronghold for cheetah, with numbers remaining reasonably steady, whereas in Namibia, RSA have seen noticeable decreases. Soft light, and the BG is just terrific to set off the Beautiful cats..
Its good to hear there are some success stories with these beautiful animals, but so sad that overall we are still looking at around 90% mortality rate for the cheetah cubs. Gorgeous photo-such elegant cats, and a lovely portrayal. I'm sad to read about the high mortality rate-hard to imagine-they look so strong and healthy. A WOW shot of some beautiful animals! Couldn't have asked for a better pose.